Heart failure is a global health concern, affecting millions of people and keeping them from their everyday lives. But what if there was a device that could keep patients’ hearts pumping and even improve their quality of life? In his keynote presentation at the COMSOL Conference 2018 Boston, Freddy Hansen from Abbott Laboratories discussed a heart pump that could do just that. If you missed his talk, you can watch a recording of the video and read a summary below. “The most complex machine ever implanted into a human being” — that’s how Freddy Hansen described the HeartMate 3™ left ventricular assist device (LVAD), a pump developed by Abbott Laboratories that has a magnetically levitated rotor for patients with heart failure. At Abbott, Hansen’s team works to improve LVAD designs to compensate for the weakened muscle in the left side of the heart and thereby avoid the pooling of blood in the heart, which can be fatal. While other electronic implants (such as pacemakers) use only microwatts of power, LVADs must pump the entire bloodstream and therefore use a significant amount of power, around the 10-watt range. Other challenges for designing these devices are that they must be small enough to fit inside a patient’s chest and be bio- and hemocompatible. To address these issues, Hansen and his group use simulation. Hansen said that he uses the COMSOL Multiphysics® software to simulate all components of the LVAD system design. These components include an electric motor with magnetic bearings that levitate a rotor inside the device, as well as sensors and other electronics, such as electric motor control. Because each part of this system is life sustaining, Abbott engineers need to ensure each component functions as designed. The HeartMate 3™ LVAD is the only part of the system that is inside the human body, and the power for the device comes from batteries and moves through a cable that goes through the patient’s skin. The controller is a patient-interface device that has buttons to help monitor the LVAD’s performance (it also includes emergency batteries). 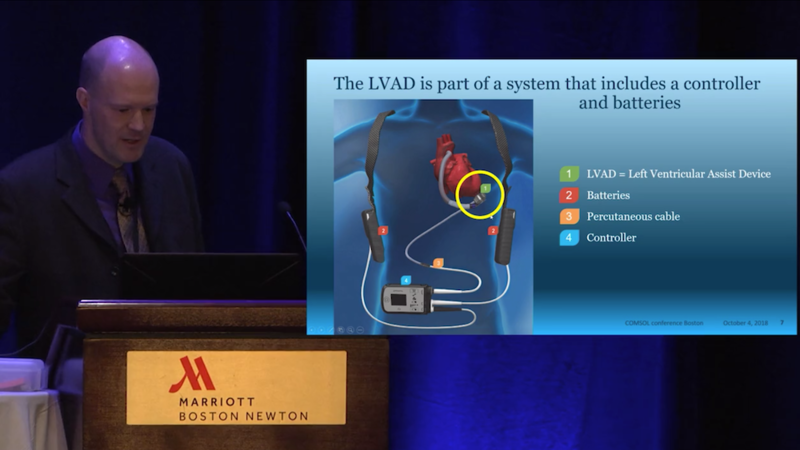 From the video: An LVAD system. The LVAD is implanted within the chest, while the rest of the system components are outside of the body. Hansen gave several examples of how he and his group use various modeling techniques to accurately analyze all of the components and multiphysics interactions of the LVAD system design. For instance, when designing the HeartMate 3™ LVAD, they created a motor model that contains a magnetic field in the rotating part, with several coils around the core to spin and levitate the rotor. Let’s take a look at some more model examples below. While working on the LVAD design, Hansen posed an important question: How hot does the skin get close to the controller? As he pointed out, it’s important to determine the controller device’s temperature when against the skin, because the patient can’t just remove the device if it gets too hot — it’s what’s keeping him or her alive! To find answers, Abbott researchers designed a bioheat model with layers of skin, fat, muscle, and viscera on one side of the controller and a clothing layer on the other side to simulate the thermal effects. The model had long-distance blood cooling as well as custom convective cooling on the clothing layer with a heat transfer coefficient. 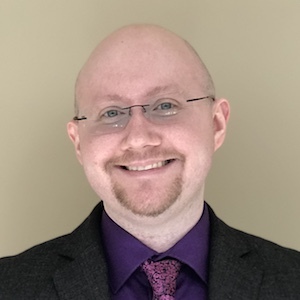 The Abbott team also looked at ways that they could replace the percutaneous cable with wireless power transfer — an objective that Hansen called the “holy grail” in the industry. 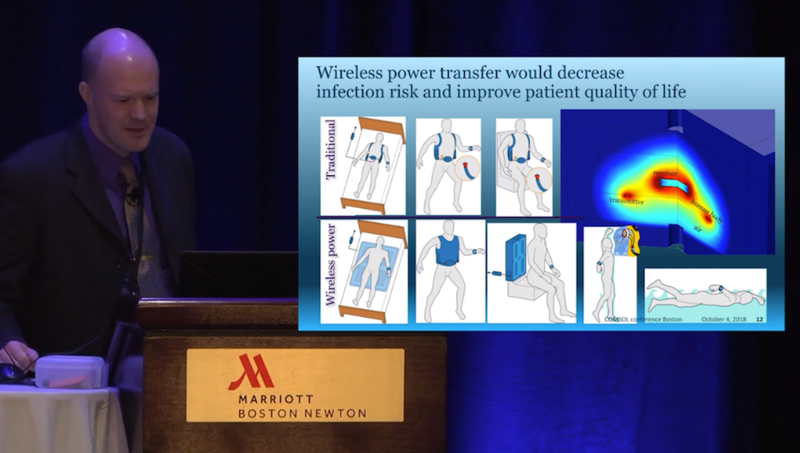 If accomplished, wireless power transfer would decrease the infection risk at the entry site. Not only would the improved device save patient lives but also greatly enhance their quality of life by allowing patients to shower and swim. To explore this possibility, the team developed a model of a 3D magnetic field and 0D electrical circuit in order to evaluate the efficiency and power loss. Adding the electrical circuit capability was important in this case, since the electrical circuit and magnetic coils are strongly interactive. From the video: The wireless power transfer model design. Hansen continued his keynote presentation by discussing how CFD modeling helped the team track the blood flow path through the device. The flow field through the LVAD was solved as a true multiphysics problem in terms of its interactive and cyclical nature. When studying the blood cell concentration, shear stress needs to be accounted for, because blood cells move away from higher shear stress locations. This movement affects the viscosity of the blood, which affects the flow field and, in turn, the shear stress. When performing a qualitative evaluation of flow for their LVAD design, the researchers made sure that there was no blood flowing from the rotor back into the inlet, since this results in a lower efficiency and a higher risk of blood damage. Hansen also talked about using particle tracing to compute “washing”, which is how long a blood cell stays in the heart pump. They found that they could sort the particles by escape time as well as calculate advanced blood damage using simulation. Hansen concluded by saying that he and the Abbott team used more than 300 models for this design as well as dozens of products and prototypes. Simulation has made it possible for them to create an optimized LVAD system and develop the HeartMate 3™ LVAD for practical use. So far, the HeartMate LVADs have saved more than 35,000 lives of patients with heart failure. Some patients go on to run marathons and participate in many other sports and activities, but what’s truly impressive about these systems? They keep hearts beating and patients alive and well. Want to learn more about Abbott’s heart pump simulations and LVAD system design? Watch the video at the top of this post. HeartMate 3 is a trademark of the Abbott group of companies.